On March 15, members of StFX and its surrounding communities gathered for a night of hope, support, and celebration of life. Relay for Life had taken over the Oland Centre and hosted hundreds of participants all working towards an excellent cause; bring awareness to the effect’s cancer has on the lives of Canadians. An international event, Relay for Life has been the Canadian Cancer Society’s primary fundraising event for 20 years. Typically, at Relay, you will find participants walking around a designated track for the entirety of the night. At least one member of each team must be walking the track at all times. This symbolizes how in more ways than one, we are all affected by cancer in our lifetime. Relay for Life throughout the years has successfully conveyed across the world the idea that no battle should be faced alone. Wherever you are and whoever you are, by participating in Relay for Life you are following in the footsteps of thousands of others who have walked them before. Relay for Life is a key player in bringing change to the future of cancer research and awareness. StFX’s Relay for Life was organized this year by students Hannah Greene and Elizabeth Talbot. Elizabeth can also be noted as the top participant of the event, who brought more than one thousand dollars of donations to the event. Another noteworthy contributor to the event was the team “Kids Against Cancer.” This team brought in an incredible $2,208.65 to 2019’s Relay for Life event. These kids shared a heartfelt speech at the beginning of the event and showed tremendous amounts of poise, courage, and wisdom. A native of Halifax, NS, Marchand posted a record of 34-23-0 in 60 regular season games over the past three years with the X-Men, including a career 2.67 goals against average and .916 save percentage. He was a key part of the 2017 AUS champion X-Men squad and earned AUS all-rookie team honours in that his first season. Marchand was a two-time AUS first team all-star in 2017 and 2018, enjoying his most successful season in 2018 when he was named AUS most valuable player, U SPORTS first team all-Canadian, and was honoured as the U SPORTS goaltender of the year. AUS finalists the past two seasons, Marchand helped backstop the X-Men to a U SPORTS silver medal in 2018 and a bronze medal just last week at the University Cup championship. Marchand previously garnered attention when he attended the Chicago Blackhawks development camp in July, 2018. He will join the Indy Fuel squad who currently have a 32-30-2-2 record in fourth place in the ECHL’s Central Division. Joseph Odhiambo is a StFX alumnus who is a former Senior Class President and member of 1993 StFX University Basketball team that won a national championship was inducted into the Hall of Fame in 2008. Odhiambo also led efforts to fund and nominate Agnes McLennan as the first honorary recipient of an X-ring, based on their meeting during summer classes at StFX when McLennan returned to complete her studies in her late 60s. Odhiambo will lead an expedition to the Mount Everest Base Camp Expedition to raise awareness and $5 000 in scholarship funds for secondary and post-secondary students in the Mathere slum of Nairobi, Kenya through the Canada-Mathare Education Trust (CMETrust), a registered Canadian charity. Mathare is one of the largest slums in Africa and residents lack access to basic necessities such as water, electricity, roads, and waste disposal. Unemployment and precarious employment is common, with the result that most families struggle to meet their basic needs. Education is a key step in addressing these challenges. However, in Kenya, education is not free after the primary level and many families cannot afford to send their children to secondary school due to high tuition fees and the cost of uniforms, textbooks, school supplies, and transportation. CMETrust scholarships cover the annual costs of secondary education and are renewed annually based on progress reports. In addition, CMETrust provides support to graduates who achieve high enough marks on their school leaving exams to obtain direct entry to a university in Kenya, helping them to pursue post-secondary studies. Odhiambo was also born in Nairobi, and he has always been grateful for the opportunities that Canada provided for his family since immigrating in the 1970s. The purpose for this trip is to support, in some small way, Kenyan children and youth who are trying to build better lives under difficult conditions. The expedition is a hike at elevations ranging from 9 318 feet to a maximum of 18 192 feet. As a sub-objective, the expedition will is also to draw attention to the accumulation of waste and garbage that has built up on the trail leading to the base camp and summit by participating in efforts to remove the build-up of non-recyclable and recyclable products that has accumulated annually since the 1990s. While students and faculty are beginning to frantically wrap up the academic year, there is already a number of community members and alumni managing details of Homecoming 2019, taking place this following fall semester. While Homecoming is always jam packed with celebrations, this year’s festivities will have a number of noteworthy milestones to commemorate in both health and athletics. This includes the 50-year anniversary since Mount Saint Bernard Athletics’ merged with StFX Athletics, and the 25-year anniversary of the Wellspring being established. The celebration of these milestones is also a wonderful opportunity to recognize the immeasurable contributions of strong women to StFX University itself. Mount Saint Bernard College, the Sisters of St. Martha, and every woman to pave a path for those after are worth thanking and commending and there would be no better time to do so than StFX Homecoming. Mount Saint Bernard College was founded in 1883 and provided post secondary education for young women. At the time, StFX college was an all male post secondary institution. The two schools were closely affiliated and by the early twentieth century, both young men and women were taking classes together under the chaperoning of nuns. It wasn’t until 1969 that the female athletes of Mount Saint Bernard could compete in varsity athletics under the StFX umbrella. The advancing academic year will mark the 50 year anniversary of female varsity athletics at StFX. This highlight will be greatly celebrated at Homecoming 2019, as well the countless accolades achieved by the X-Women over the previous five decades. For the purpose of celebrating the contributions and legacies of female athletes and leaders at StFX past and present, the customary Homecoming schedule will be adjusted solely for 2019. The Saturday afternoon game at Oland Stadium, classically showcasing the X-Men football team, will be replaced by an X-Women Rugby game. The 2018 USPORTS national champions will face Acadia at 3pm on October 5. This is one of the most noteworthy changes, as this will be the first time a female varsity team has been showcased in the main athletic event on StFX’s Homecoming weekend. The football team will instead be playing on Friday, October 4 under the lights against Bishop’s University. Another commemoration being made at this year’s Homecoming will be granted to the deserving Wellspring; a safe place established by the Sisters of St. Martha to serve the Xaverian community. Located on the second floor of Morrison Hall and found next door to Mini Moe’s, the Wellspring has provided community members a wonderful haven to recharge. The Wellspring has been a massive contributor to the general well-being and health on the StFX campus, and the strong women of St. Martha’s are the ones to thank. Whether its yoga, or a quiet space, the Wellspring has a way of promoting health around the community. On Friday, October 4, there will be a Wellspring open house from 2-4pm. This will provide a chance for guests to get a close look into the work the Wellspring does and the help it provides. Over the first weekend of March, I had the amazing opportunity to attend the Sloan Sports Analytics Conference (SSAC) in Boston, Massachusetts. SSAC brings out all the best sport analytic companies, along with students and a plethora of esteemed individuals within the sports industry. A total of 3500 attended and it included 69 panels, six workshops and a live podcast studio. My personal favorite panel followed the soccer one. This one was on unicorn hunting. No, not the mythical being, but a mythlike basketball player. The term was coined after 7’3 forward Kristaps Porzingis was drafted. He provides an intriguing blend of three-point shooting and shot blocking ability, something virtually impossible with his size in prior eras. The panelists included former Celtic Paul Pierce, ESPN writer Zach Lowe, assistant Celtics GM Mike Zarren and Golden State Warriors Bob Myers. Myers coined a unicorn as “the highest level of rarity for a basketball player. Someone who stretches the limit of reality.” Shaquille O’Neal was brought up, in the pondering of if he was in today’s era of basketball, would he be as successful? The overwhelming answer was yes. Myers told a funny story about one day taking a client out for dinner the night of a game in which that player would be guarding Shaq. The player ordered an alcoholic drink, much to the surprise of Myers. “Haven’t you got a game tonight?” He asked. The player responded “I am up against Shaq man” as he shook his head. His utter brutality was another kind of unicorn, as most agreed that they would never see another player like him again. Meek Mill along with 76ers Co-Owner and founder of Fanatics Michael Rubin sat down with ESPN host Rachel Nichols for a passionate conversation about prison reform. Mill spoke about his time within the criminal justice system and the need for its reformation. Rubin struck up an unlikely friendship with the rapper and was completely baffled by the treatment of individuals like Mill within the criminal system. They co-founded the REFORM Alliance, aimed at changing laws and policies. Rubin spoke candidly about his privilege, and utter disbelief on the criminal justice system now. Mill has been in the system for approximately half of his life, and he still has five more years to go for probation. The main way for this reform to take place was probation and simplifying the rules for it across all states. Right now, states like Pennsylvania have no limit to the amount of probation years that can be given. This can be crippling to people, especially those with limited financial means. Later on in the day, the technical director for FIFA provided a case study on the utilization of compact defending, and its success within the World Cup that occurred last year. It seemed to show a new trend in soccer, where every team bunched up their defense, leaving a large amount of open space wide, but greatly reducing the ability for offensive players to cut inside, where there would be a higher percentage of goals potentially scored. It was an intriguing study, and one that was made possible with the dearth of statistics available from FIFA. I then attended a discussion on the new team LAFC, and how its unique brand identity enabled them to create a phenomenal product in only its first year in the MLS. I also was fascinated by the plethora of research papers that were on hand, including one that created a mathematical equation to value NBA draft picks and the protections that they come with. 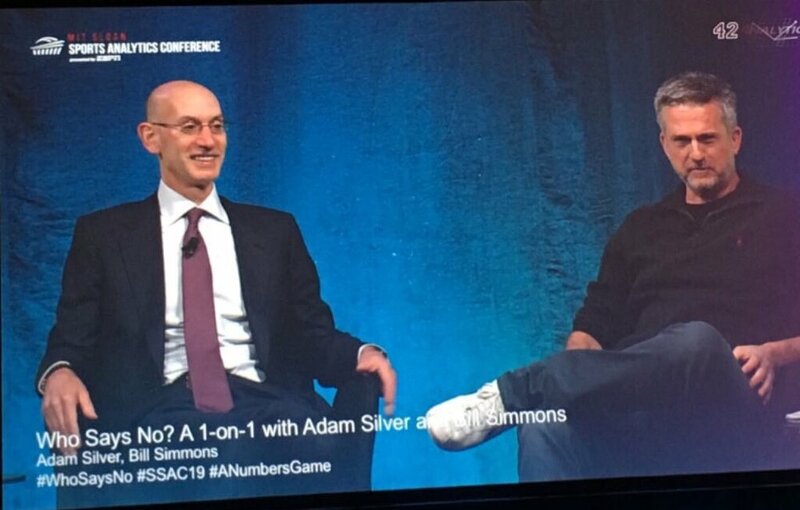 The most popular panel of the weekend was a one-on-one with Commissioner Adam Silver and The Ringer founder Bill Simmons. The main talking points that was taken from the chat was the realization from Silver about the age of anxiety that all players live in. Despite the million dollars and all that it comes with, lies a very real mental health problem, mainly entrenched by mobile phones and social media. It was important that Silver addressed this, and he too said he goes to sleep most nights anxious and fretting about microscopic decisions that had happened throughout his day. Day two was just as jam packed (shout out to 5-hour energy and the free coffee for keeping me awake!). Malcolm Gladwell (author of 10 000 hours) sat down for a chat with David Epstein to discuss Epstein’s new book, called Range. Range focuses on the overvaluation of specialization, and the need for more generalists within society, as they have a higher chance of becoming more successful. Specifically, they talked about the Tiger Woods/Roger Federer dichotomy. Both are arguably the greatest players in their sport, but they each were trained drastically different at a young age. Woods began swinging a club at one and was primed to become a golf player before he could even speak. Federer, on the other hand, played soccer, badminton, basketball. It was only when he was in his mid-teens when he began specializing. Federer cited the reason for his great hand-eye coordination had to do with the myriad sports he participated in growing up. After Gladwell posited the question of why Woods’ story is more enticing to people, Epstein believed that it was because of our obsession with precocity. For example, parents love to boast about their children’s early achievements. Having one read or be potty trained by a certain age brings about pride from the parents. However, these are closed skills, which would be attained regardless in your upbringing. Instead, Epstein believes in letting your child play as many sports as possible, so to have refined skills in various activities. In the final panel of the weekend, author of Moneyball Michael Lewis spoke with Washington State head football coach Mike Leach. Leach has been called the most interesting man in football. It was a hilarious hour listening to Leach riff on his obsession with pirates, to literally bringing on a student from the stands to kick field goals for his team. Many of the panels are available to be watched on the YouTube channel 42 Analytics. I would recommend anyone who is interested in sports, analytics, numbers, or even just panels, to sign up for next years event. You get a large discount if you are a student, and it comes with perks, such as a integrated job board that provides employers with information on all delegates who attend. It is my hope that I will return soon to SSAC—not as a student, but as a professional! March is nationally recognized as Nutrition Month across Canada. Nutrition Month is a celebration of food and nutrition as well as celebrating dieticians and nutritional health professionals. As the only regulated nutrition professionals in Canada, Registered Dietitians are responsible for providing relevant, reliable and evidenced-based nutrition information. As the 2019 dietetic interns on campus, we are celebrating the impact health and nutrition has on our lives all month long with various events across campus and social media challenges. This year’s theme for Nutrition Month is “Unlock the Potential of Food.” This theme allows us to embrace the role food plays in our lives and how we can utilize it in many different ways. There are five topics covered under this theme: the potential to fuel, potential to discover, potential to prevent, potential to heal, and potential to bring us together. These topics show the many different ways we can use food to enhance our lives, bodies and minds. We are posting each day on our social media, covering these topics more in depth. Check out our Facebook (StFX Student Athlete Nutrition) and Instagram (@stfxsportnutrition) to see our posts! As the dietetic interns on campus this semester, we are taking on the role of promoting nutrition and health throughout March. We have a number of events and activities going on throughout the month that we hope brings people together in the celebration. We will be setting up booths in the Wellness Centre and Bloomfield, offering free snacks, fun activities and discussing more about the nutrition program on campus! We also have a number of giveaways planned, so please drop by and partake for a chance to win a prize. We are challenging students to use social media as an outlet to post photos of them “unlocking the potential of food” and hash-tagging #nutritionmonthatx. Dietitians help Canadians unlock the potential of food to enhance lives, improve health, inspire children, fuel activities and bring people together. Wondering about the nutrition profession and how you can get involved? To become a Registered Dietitian in Canada you must complete an undergraduate degree in human nutrition and dietetics from a university program that has been accredited by the Partnership for Dietetic Education and Practice (PDEP). In addition to this, dietitians must also obtain supervised practical experience. From here you must successfully complete the Canadian Dietetic Registration Exam (CDRE). The food and nutrition field is a wonderful career choice considering the ever-changing information and importance it plays in our society. With false information being promoted every day through media outlets as the most “credible advice”, we need Registered Dietitians in the field more than ever to help regulate what the public interprets as true. Many of the fad diet trends that are promoted to the public are not backed up with scientific evidence and could be harmful in the long run. This is why Registered Dietitians want to promote a healthy lifestyle, with room for enjoyment and new food experiences. Health is all encompassing, and we are here to help individuals and populations reach that. It is important to keep in mind that everyone’s experience with food is different. There are countless factors that impact a person’s ability to access food, and how they are able to prepare and handle the food they have. During Nutrition Month we also want to bring attention to the fact that nutrition does not solely represent eating nutritionally. The social determinants of health play a large role in the ability for individuals to access healthy, safe, and affordable food. It is important as health professionals that we are not ignorant to this, and work with individuals and communities to receive better access to help achieve the main goal of health. We hope to see you around campus and encourage you to join us in promoting Nutrition Month! Stay tuned on our social media to keep up to date with events going on in the coming weeks. The AUS playoffs around the corner and their position locked in, our X-Men, ready to end the regular season off strong were focused on their final encounter against UPEI. 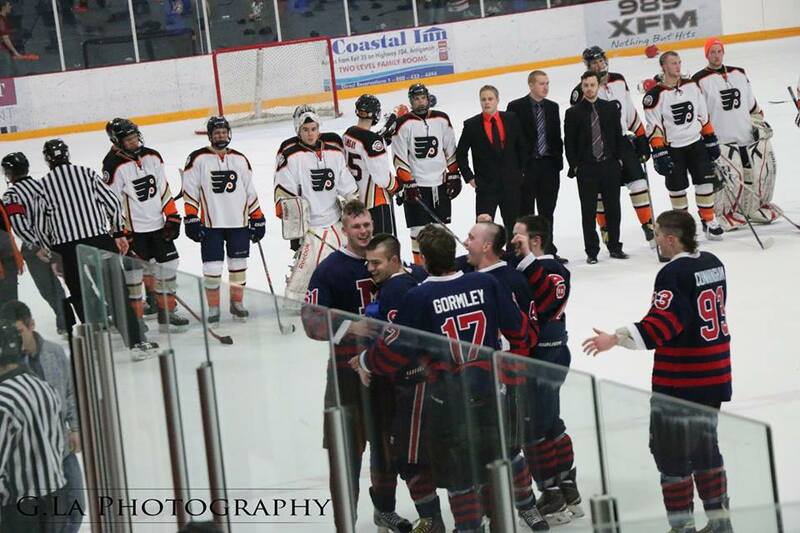 They would end up winning 95-80 and closed out their series with UPEI 2-0, finishing the regular season 7-13. All of the starters scored in double digits with Thomas Legallais (13pts, 11rbs), Azaro Roker (13pts, 10rbs), and Daniel Passley (23pts, 11rbs) all netting double-doubles. This was Passley’s eighth double-double of the season. Preceding the start of the game, our X-Men looked healthy and ready to play as they warmed up by throwing down some monstrous dunks, giving the fans a preview of what was to come. To start it off, the X-Men got the first points of the night to put them on the score board, already setting the pace for what was to be a high scoring game. From nice inside bounce passes to steals and two trips to the free throw line, the X-Men made it known that they meant business. They were spreading the floor, which allowed them to get into their sweet spots. However, they started to feel a little too comfortable by not closing out on the baseline and making lazy passes. They tried to shake it off with extra ball movement but found themselves idling on offence, forcing Coach K to call timeout. Legallais would shoot a floater in the last seconds of the quarter to beat the clock and put X up 17-11. Shaking off the final minutes of the first quarter the X-men regained both offense and defense efficiency from the start of the game. Leading the way in the second quarter, the backcourt players forced a few steals essentially changing the pace from slow and controlled to a run- and- gun style basketball game that got everyone in the stands excited. Relentlessly pushing the ball and working it down low our X-Men compelled UPEI to take a time-out. Continuing the attack, Justin Andrew used his body to penetrate down low in the post for the and-one basket. Following that play Roker tried to catch a body with an attempted poster but was fouled. Four minutes left in the quarter a spark was lit under Jack MacAulay, a UPEI third-year guard who showed the X-Men that the game wasn’t over as he splashed heavily guarded deep threes. This would be the X-Men’s highest scoring quarter with 30 points, ending the half 47-31 for the home team. UPEI started the second half slow and were unable to get a flow going. With the X-Men’s cooperation and understanding of what needed to be done it was clear that the game was in their hands. Post-players Roker and Passley put in some work down low with Passley using his footworkto makr it look easy while Roker dunked on a player, getting redemption for his last attempt. UPEI then called timeout. The timeout was in vain as Ross scored two threes in a row and Andrew gave the fans a peak into his toolbag with a gorgeous euro-step for two. Nothing in the way of a W for the X-Men, it seemed the game was in the bag, until MacAulay scored back-to-back threes and added another one to end the quarter with X fans saying, “man can’t miss.” They would end the quarter up 73-61 with MacAulay finishing the night shooting 71% from the field and 77% from the three-point line. In the final quarter UPEI was met with the same tougness by our X-Men. They showcased their versatility—with the post-players setting screens for each other, popping out to the three-point line and Passley hitting a three. Roker’s athleticism was displayed with a rim-rattling dunk that left one young fan screaming, “it’s still shaking!” The game was getting more physical with players shoving and pulling jerseys. This led to Moshe Wadley of UPEI fouling out, putting Ross to the free throw-line and making both. Our X-Men saw the light at the end of the tunnel, and finished the game with a 95-80 victory. This past summer I had the opportunity to volunteer every Tuesday at the St. James United Church in Antigonish, Nova Scotia. Twice a week there is a Hot Meal Program put on for the community members who feel as though they could benefit from the comfort of a good meal and even better company. Although I am a proud Antigonisher, prior to this I hadn’t taken the opportunity to really immerse myself into my community- getting to know my fellow community members and putting time towards something meaningful, something to be proud of. The Hot Meal Program began in 2004 as an anniversary project of St. James United Church and has developed into a strong and important part of Antigonish. During the early stages of this program it was available one day a week, but due to the dedication and work of the congregation, volunteers and fund-raising efforts, the program expanded to two days a week in 2013. Not only is this program offered to community members two days a week, but every year on December 25 there is a huge Christmas meal put on at the church for community members. None of this would be possible without the dedication and selflessness of helpful community members and volunteers. As a member of this small, tight-knit town, I’m aware of the huge impact volunteering has on the community. Being part of a university, whether living in residence or part of school teams and clubs, the relationships built with classmates and professors are essential for wellbeing. Students face massive amounts of stress we committing to university- the assignment and paper deadlines, midterms, exams, classes, all of this while trying to maintain a healthy balance of a social life and self-care. Typical suggestions to help keep stress at bay such as exercise, eat healthy, sleep lots, take a break are great but volunteering is a path to emotional wellness in my experience. Often, volunteers are thought of as retirees, students who are involved with service learning or looking to add experience to their resumes. Volunteer work requires giving time, creativity, kindness to others, not expecting or taking anything in return. In the short year of volunteering I’ve done, I have learned the extraordinary ways in which volunteer work can truly help a stressed-out student in ways that I never thought possible. When doing volunteer work, I have a sense of accomplishment that follows and I’m proud of the ways in which I contributed. The truly warm emotional wellness feeling upon nourishing a relationship with the community members is rich like no other. According to research done by Stephanie Watson, a writer for Harvard Health Publishing, there are many benefits to volunteering, contributing to both mental and physical wellness. Volunteering is said to strengthen social bonds, combat loneliness and depression, give oneself meaning and purpose. Volunteer work allows for the development of more access to social and psychological resources, which are known to combat moods such as anxiety and depression. It has also been recently discovered that volunteering can lend a hand in maintaining a healthy body- decreases in high blood pressure were found, as well as an increase in physical activity and stress reduction, which contributes to overall health and wellbeing. As a student with a very tight schedule between education and job, I encourage readers to immerse themselves in community engagement by volunteering. No matter how big or small of a commitment, volunteering is beneficial to the individual and community network. Registered Dietitians are health care professionals trained with the most up-to-date and evidenced-based information to provide advice and counselling regarding diet, food and nutrition. In social media, false information is often promoted as the easiest way to achieve the optimal goal of health. Thus, the role of a Registered Dietitian to support evidenced-based information is more crucial than ever. My name is Leah Gouthro and I graduated from the Human Nutrition program at StFX in May of 2018. I decided early in my degree that dietetics was the field of study that spoke to me the most, recognizing its importance today. This program allows students to gain experience in the field of dietetics with a wide range of professions, including community/public heath, food service, and clinical-based experience. This program differs from the graduate programs as students are competing against a smaller pool of their own peers within the program. Each year there is a limited number of placements in the Maritimes taking interns from StFX. Each intern will spend fourteen weeks in a community on food service and clinical setting where they gain exposure helping to broaden their career choices. In my opinion, the Dietetic Internship program gives students a chance to gain hands-on experience in a variety of settings. I am currently completing my second practicum as part of the internship program, which is the sport internship community placement. I have always taken a key interest in sport nutrition and dreamed of pursuing a career as a sport dietitian. This placement gives interns the incredible experience of working with varsity athletes on improving their diets, educating them on nutrition through presentations or individual consults, sharing simple and healthy recipe ideas with teams, and more. As a future dietitian, I take pride in promoting a profession which holds so much importance. My goal is to work with people, educating them on proper nutrition, healthy choices, most importantly, removing barriers that prevent them from achieving success with respect to their own nutritional goals. My name is Cassie Crowe and I graduated in May 2017 with my B.Sc. in Human Nutrition. After doing a fifth year to upgrade, I was accepted into the Integrated Dietetic Internship (IDI) program last year and began my internship this past September. It took me a long time to decide that this was the path I wanted to take, but I’m very happy with my choice. The Sport Nutrition placement available here at X is an opportunity that not all dietetic interns get through other schools and I’m super blessed that I’m able to have this experience. Sport Nutrition caught my interest a lot when I was first taking that course (and even more last year when I took it again to upgrade), and this placement is really proving to me that I’d like to work in this field someday. I’m super excited to work with teams and individual athletes every day! The IDI program here at StFX is open to all third- and fourth-year students in the Human Nutrition program who meet the grade requirements to apply. It’s a necessary step for anyone who wants to become a registered dietitian; dietitians must complete a four-year bachelor’s degree, a 40- to 45-week unpaid internship, and finish by writing the national registration exam before they can practice as professional (PDt)/registered dietitians (RD). PDts/RDs are the only regulated nutrition professionals in Canada, meaning they’re held accountable by a governing body (in our province it’s the Nova Scotia Dietetic Association) that monitors their health practices. On February 6, our X-Men basketball team were ready for battle when they faced off against the Acadia Axemen, winning a tough game 75-72 and ending their regular season matchup 2-0. In their second encounter against the Axemen, a familiar face to the town of Antigonish returned, the Axemen Forward Temitayo Shittu (Tayo) #21, who was a StFX Alumni and a former X-Men in his first year at StFX. Playing the last placed team Acadia with only four more games left in the season, the X-Men had to use their home court advantage and leave it all on the court, as they played a hard and resilient game throughout. This win over the Axemen on Wednesday would change the AUS standings, placing them above the Memorial Sea-Hawks and raising morale for the X-Men, in hopes of clinching a playoff spot and establishing themselves as AUS championship contenders. To start off the game the X-Men were in a groove, with great inside passing coming from the guards and defensive rebounds (drb) from Daniel Passley, who padded his stat sheet for the night with 15 points (pts), 10 drbs, two assists (ast), one steal (stl) and one block (blk). The X-Men were able to convert their hustle into a few trips to the line. Unfortunately this wouldn’t last, with hurried attempts coming early in the shot clock, weak perimeter defence (allowing 11 three-point attempts) and Justin Andrew (#6) suffering a minor ankle injury early in the first. The X-Men would end the quarter down 19-12. Continuing their aggressive attacking offense in the second quarter the Axemen relentlessly penetrated down low through the baseline with their forwards, making cuts and switches. This allowed Tayo to sneak in eight easy points. The X-Men switched to play a zone defence, with its goal to close-out the perimeter gaps. However, they were unable to stop deep threes from Nick De Palma, who’s range in knocking down the long ball resembled NBA superstar Stephen Curry. De Palma would end the night shooting 66% from beyond the arc. Not long after, the X-Men increased their intensity on defence and adjusted their strategy by executing a full-court press on Acadia, which immediately garnered results as they would force a shot clock violation. On the offensive end the Axemen continued to close out on defence, making it difficult for X to create good shots. With four minutes left on the clock and the shot clock running down Andrew was forced to take a deep three which he made while being fouled, giving him the four-point play. The X-Men ended the quarter strong with great ball movement and a slick behind the back pass from Nick McKee to Andrew for the three bomb. The X-Men ended the half with Acadia up 36-32 and the lead within their grasp. Starting out the third, the X-Men played unusually bad defence which allowed Acadia to walk right in for easy layups. However, X-Men post player Daniel Passley brought out his bag of tricks and with tight “D” on him threw up a nice sky hook to close the gap to 38-40. With a switch in lineup, the X-Men had three guards which made it a run-and-gun game, allowing for more ball movement and flexibility on the court. This led to more opportunities to make some triples. The lead was within reach and tensions were rising as the big men were aggressive and muscling through contact in the post. They began shoving each other to claim dominance down low with Atik Gilao yelling “You can’t guard me” after being fouled. Trailing 50-51 to Acadia the X-Men remained strong on both ends of the court, with great cutting, switches on offence and playing a united help defence this would be the turning point for X, with Tristan Ross #5 sacrificing his body for the charge. On the next play Passley used his footwork beautifully on a bounce step that led to a ferocious dunk. The energy was palpable in the arena and not long after, X-Men forward McKee went up for a board but was viciously fouled and put into a headlock by Tayo, which led to both teams getting in the middle of the altercation and separating the two players. They both received technical fouls, which led to Tayo fouling out. On Saturday February 2 the X-Men basketball team suffered a heart-wrenching loss as they trailed the Memorial Sea-Hawks in game one of their back-to-back, 82-79. Their bench gave more than a helping hand with 28 points in the game. In the first quarter the X-Men seemed lost and at a disadvantage as they played Memorials’ fast-paced game built on X-Men turnovers and shot attempts. Trailing in the second quarter during a close game, the X-Men held on with an increase in ball movement and off-ball screens as well as a defensive hustle from Daniel Passley that kept the X-Men within a few points of the Sea-Hawks. Passley ended the game with 10pts (points) 14reb (rebounds) and nine dreb (defensive rebounds). The X-men didn’t start the 2nd half off great, giving up three straight baskets and three turnovers in the first minute and thirty seconds. In addition, Emanuel Ring of the Sea-Hawks got a monster block to put the X-Men down by eight points not long after. Although lacking effort on offence and unable to finish plays, they slowly showed signs of life and started to penetrate the Sea-Hawks defence in the paint. With under 2 minutes left in the quarter, the X-Men gained momentum by working together and stepping up their defence. Azaro Roker, #12, forced a critical turnover with a block shutting down Ring who’s currently the fourth leading scorer in AUS Men’s Basketball. Following that play, Atik Gilao of the X-Men would step in and draw the offensive foul charge, one of his many trademark attributes. In the fourth quarter, it was obvious that the X-Men were still in it to win it only trailing by six. It wasn’t a big stretch and they’ve come back from worse. Great focus on passing, rebounding and ball movement led the X-Men to post their highest scoring quarter of the night. After a push from the backcourt and a couple three balls from Thomas Legallais and Justin Andrew, the X-Men were up 77-76. The following play, Nathan Barker of the Sea-Hawks would take the ball cross-country and score a bucket and foul giving them the lead 79-77; the youngest of X fans ran the sideline chanting, “We want Defence” with only 15 seconds left. “I wish them the best,” said StFX student Lucas Lawrence. Even with community support, there wasn’t enough time for the X-Men to make a come back. On Sunday February 3 following their defeat by the Memorial Sea-Hawks the previous day, the X-Men were without Roker who suffered a knee injury. Roker averages 10 ppg, 10.5 apg at 41.8 FG %. Gilao led the way with 23 pts and 12 reb while Legallais, Tristen Ross, and Justin Andrew all scored in double digits with Andrew taking control of the rebounds with 11 and nine defensive. It was a new day and a chance at redemption for the X-Men who left their 22 turnovers behind to defeat the Sea-Hawks 88-81 in a fast-paced game that got the fans out of their seats. Unselfish passing and a tight 2-3 zone defence forced two turnovers which translated into a block from Gilao and a few trips to the free throw line. StFX started off the game with a 13-point lead and finished the first quarter with a shot clock violation by the Sea-Hawks to put the X-Men up 23-17. The X-Men trailed the Sea-Hawks in both the second and third quarter in points. Both squads struggled with transition offence, yet the X-Men’s patience on offence led to fewer turnovers overall. The X-Men were finally playing their game – slow, controlled, and full of passes with cuts. The third quarter was a back and forth battle, but it ended 55-54 for the X-Men. In the final frame, the X-Men lost the lead as they showed signs of fatigue; being overcrowded on offence coupled with bad shot selection and rushing the ball, the X-Men were slow getting back on defence. Making some changes on defence, their focus changed for the better as they started feeding post-players Atik Gilao and Daniel Passley who combined for five baskets and successful trips to the free throw line widening the gap to put a lid on the game. X-men won the second encounter against the Sea-Hawks 88-81. These last few weekends have been busy with home and away games for all StFX winter sports teams. Students, alumni and community fans have been flocking to the Keating Centre to watch home games since the beginning of the second semester. Little do we know of the competitive indoor varsity team that must compete solely away from home, all the while doing a large part of their training on the track – outside. The other evening, the X-Men and Women sprinter groups were outside bearing the elements. While music blasted through the stadium speakers, sprinters blew down the straightaway under the field lights in the pouring rain. By this time, the track was virtually clear of the week’s worth of snow that had accumulated across its eight lanes. The women’s team captain, Allie Flower, and fifth-year Tim Brennan, can attest to the ice-free lanes one and two. “[Coach Eric Gillis] clears the track… and we make do with what we have” they both said. When the teams cannot have workouts outside, the men and the women take to the rubberized walking track around the Auxiliary Rink. During the last weekend in January, the men and the women competed at the McGill Team Challenge where they raced against some of the most competitive individuals and teams across Canada. For many of StFX’s runners, this is the one weekend to go for broke and try to clock a personal best while keeping up with big names and teams outside of the AUS. For the two-time AUS Cross Country Champion and 2018 USports 3000m Gold Medalist Angus Rawling, this weekend in Montreal was just what he needed to propel himself into the latter part of his season. Rawling has his sights set on maintaining his unwavering presence in the distance events this winter. This past weekend, Rawling and secnd year X-Woman Jane Hergett ran at the Boston University David Hemery Invitation Meet. Gunning for a solid tune-up and a PB in the 3k before his big test at USports, Rawling smashed his previous PB with a time of 8:03.34. Poised and confident in his speed endurance, Rawling says he wants “to run the 1500m to see what happens – because anything can happen on the 3rd day of the finals, everyone’s tired.” His goal is to run a sub 8 3k and also focus on both of his distances using one to help with the other. With several strong individual performances, both the men and women are seeing their respective teams come together. The cohesive synergy is apparent – both the Women’s 4x800m and 4x200m teams had their best showings. Both teams have currently set themselves up to be able to compete at USports on the national stage. With several veterans, including Hana Marmura, Zoe Johnston, Allie Flower, Paige Chisholm, Catherine Kennedy, Samantha Taylor and Megan Graham as well as rookie Aidan MacDonald, the women have made a collective statement across the AUS and are a focused unit. On the men’s side, 600m specialist Tim Brennan is also finding the balance between individual and team performances. Coming out of Montreal with a new PB of 1:20.05 in the 6, Brennan also has a few goals in mind for the rest of the season. As he trains with teammate and high school confidant, Adrian Kinney, Brennan’s goal is to medal in the 6 at AUS and compete with the best at USports in his event. On top of this, the 4x400m relay team comprising of Brennan, Kinney plus Brad Barclay and Eric Sutton are also preparing to capitalize on the momentum they’ve accrued this season and make a move on the fastest teams across Canada. Having just beat their previous record with a 3:22.10 this past weekend, the men are ranked 4th in USports. Both the women and the men continue to fine-tune their training as AUS approaches on the 22 and 23 of February in Moncton. Many of the runners are confident that there will be a larger showing at nationals this year. As the 12 year-old team gains provincial and national traction, it is clear that these track athletes have a tremendous amount of respect for the team aspect of the sport. Supporting one another during workouts in the cold, pushing each other through their intervals, and holding each other accountable for every lap, second and millisecond on the track. Time, as Rawling stated, is what defines you in the track world – which is both the rewarding and terrifying aspect of the sport. Everyone is out to make a move, size themselves up versus the clock and surge ahead of their competitors. It can be anyone’s day, but the little moments count. Bowen Assman interviewed Josh Crouse on February 4, 2019. BA: Tell me a little bit about your background and how you got to StFX? JC: Okay perfect. Well I grew up in the south shore of Nova Scotia playing a lot of different sports, however hockey and volleyball were my primary focus. In grade 12, I was offered the chance to play volleyball at the University in New Brunswick. After two years there I found it just wasn’t really a good fit for me, so I ended up transferring to Acadia University. While at Acadia I took part in the exercise physiology program. Part of the program included a practical component where we were required to get so many hours of volunteer service within different areas of exercise physiology. One of the areas within the practicum that really sparked my interest was Strength & Conditioning. It was then that I discovered my passion for training athletes. I graduated from Acadia in 2015 and was actually hired upon graduation. It was kind of right place at the right time as the guys role who I filled ended up moving on to work for the San Antonio Spurs in the NBA. He’s now doing his PhD over in New Zealand working with professional level athletes. Needless to say he was a pretty cool guy to learn from. After graduation I worked at Acadia for three years under the guidance of Elliott Richardson who is the head Strength & Conditioning coach there. While at Acadia I worked with volleyball, both basketball teams, swim and cross country as well as ran a private business and was the Assistant Coach of the Women’s Volleyball team. In June the job opened up here and I decided to take a stab at it and I’ve been here since July. BA: As the head Strength and Conditioning coach here, do you work with every single team? JC: I work with all 12 teams here. So, around 350 athletes. BA: I was talking to a rugby player, and they usually would have volunteer coaches or the head coach would do their Strength & Conditioning. Now, it’s just all through you? JC: It’s all through me. Yeah. So basically, in the past, I think there was, five or six teams that were working with the strength coach previously. But when I got here, I made it a priority to make sure I was looking after all 12 teams. In the past, not all 12 teams were training. So now all 12 teams are training in the weight room up to four times every week. BA: Do you have any goals of starting up a private performance training business here? JC: Yes, we actually have already started a little bit of a private business. We have six kids right now that train with us that are from Dr. J.H. Gillis. And then we have a few others who are coming from away as well. Right now, we only work with them twice a week. But my goal is when we get a new facility is to grow this business. Now, this summer we will be starting to train a lot more youth athletes from the surrounding areas, and then maybe a few professional athletes as well on top of our StFX athletes that stick around for the summer. BA: Are you looking forward to any changes or improvements to our current strength and conditioning program here? JC: Yeah, for sure. I guess I just started here in July. So I didn’t want to change too much too quick. My number one goal when I got here was to get every athlete training and we’ve succeeded at that after the first semester. I guess the next goal is just to try to get a little bit better at everything. I really want to try and grow the internship program. We currently have 12 interns, and then I have an assistant Ian McNeil who helps me with football, rugby and our private business. Right now we have at least one intern with every single team. Now my goal is to get that to two, I’d like to have one senior intern and one junior intern. So junior being a first or second year and then senior being a third, fourth or fifth year. Right now, our internship is predominantly made up of males however I want females to feel more comfortable getting involved with strength and conditioning. In the past, my female interns have often been some of my best interns. BA: Do you work in conjunction with the athletic therapists? JC: Yes, for sure. This is one thing that I also want to develop is more of a Integrated Sport Science team (ISST) within our athletic department where strength & conditioning, therapy and sport nutrition can work together as more of a unit. When I first got here, everyone was kind of doing their own thing in a sense. I think we’ve done a better job of opening up communication and making sure that we’re working together because in order for an ISST to be successful, we all need to be on the same page in order to make sure our student-athletes have the best experience. BA: That internship program started just this year? JC: Actually, no, the previous strength coach started the internship program. There was seven interns when I first got here. So we have five more now. It was a good starting point but there is definitely room to grow. BA: So the goal is to have each intern specialize in a sport? JC: Sort of. Basically, I’d like to have it kind of like the therapy program where you have two or three people with every single team so that way they can be there for the day-to-day logistics. Right now, our interns only mainly help in the weight room. But I’d like to have them be at practices and games so they can run warm-ups, cooldowns, and perform recovery or return to play work on the sidelines with injured athletes. BA: With the success this year of the football, cross country and rugby team, what part or what role do you think you played? JC: I mean, I’ve only been here for a couple months so I definitely can’t take credit for their success. However, we have made some significant changes in the day-to-day logistics of the athletes training schedules and recovery. BA: But you notice any changes? JC: I’ve had a lot of really good feedback from the athletes and coaches thus far. The biggest thing I want to do is help the athletes realize their potential. Before, I think there wasn’t a lot of understanding on how to take care of their bodies day-to-day. In my opinion that can be the small difference between an athlete being good versus being great. You have to learn how to do all those little things on the side when no one’s watching. So that’s my goal is to be able to help our athletes understand how much work it takes in order to get to an elite level. I’ve been lucky enough to work with some pretty high-end athletes and that’s the biggest difference I notice, is they all do the little things extremely well. BA: Do you think being a recent graduate from university helps you relate to athletes? JC: That’s the big thing for me is I was in their situation not that long ago. So, I find it easy to communicate and relate with our student-athletes. There’s a lot of coaches out there that played say, 20, 30 or 50 years ago, and now coach. Things have changed significantly in the last 10 or so years so it can sometimes be challenging for these coaches to be able to understand and communicate with today’s athletes. Now granted, I’m not saying they can’t coach because they most definitely can but it’s definitely easier for me being fresh out of school. I find the biggest change is the day-to-day stuff on how busy and distracted we are now, as student athletes. It can be really challenging to get things done as well as stay on top of the social pressure that is now placed on today’s generations. One thing I often hear and was guilty of saying myself is, “I don’t have time”. However, there’s always a way it’s just a matter of being organized and making it a priority to manage your time efficiently. BA: Do you help the athletes with time management? JC: Yeah, I mean, I will have a lot of athletes pop in to my office every day, whether it’s just to chat or ask a question. I make it a priority to get to know the athletes and make sure that I take the time to have those conversations with them. Because a lot of times, they come in with some really good questions. And it’s important that you kind of guide them through the process. For example, I’ll have a lot of athletes that come in and want to talk about nutrition. Often the first thing I’ll ask them is how many meals they’ve had today or the day before. Often times they will say one or two and I tell them how they need to get to four or five. The first thing they usually say is “I don’t have time” so what I do is sit them down and show them where they can fit these meals into their personalized schedule and also discuss how they can purchase more affordable options in order to understand that it is possible. Our sport nutrition team has done a really good job of getting the information out there now, and they are in constant contact with the athletes. This has helped me a lot, as it takes that stress off of me to do the nutrition education as well. BA: Okay great. you have anything else to say? JC: I guess the big thing would be giving a couple shout-outs and thank yous because I wouldn’t be able to do this without help. Although, I’m the only one under contact it’s not a one-person job by any means. My assistant Ian Macneil and my interns Jordan, John, Ryan, Bo, Liam, Jenna, Keegan, Kieran, Taylor, Syahrul, Dave, Iris & Blake have all played a huge role in making this happen. It takes a team effort, and they’ve all been great helping me through my first year. I’d also like to thank the athletes, coaches and rest of the athletic department as well. They have made the transition for me very easy. They have been very open and receptive to feedback and criticism as they all just want to get better just like me. There are some times where you walk in as a new guy and it can take a while to earn your place, but everyone here has been very welcoming since the day I got here and I thank them for that. As each new year is bestowed, StFX’s students leave their hometowns and cities to return to the quiet town of Antigonish for a second semester of the academic year. Other than courses and weather, not much changes about StFX in the new semester. One thing that proves to make the spring on campus so unique, however, is hockey house cups. Hockey house cups are a long standing tradition at StFX. House cup season often takes place over the span of three months, starting in January and ending in March. The season entails numerous hockey games amongst rival residences to vie for trophies, the preferred after-party and more importantly, bragging rights. Residences at this school have many unique traditions and dynasties, some of which had outlasted the very walls of the buildings they occupy. These games have proven to be some of the biggest athletic and social events on campus. They bring together players and spectators alike to cheer for the houses that welcomed them into their first home and family at StFX. Since last year, there have been a number of changes to residences on the StFX campus. Residences Cameron and MacKinnon hall have become coed residences. Cameron hall, formerly divided into boys’ houses, MacDonald and MacPherson, and girls’ house, TNT. MacKinnon was formerly made up of all-girls house, Chillis, and all-boys house, MacNeil. MacIsaac hall was reopened to first year students, and Lane hall has closed. Due to these changes, there has been some major differences between this year’s house cup season and the ones in the past. Because of the closure of Lane hall, the game between Lane and Fraser known as LaSer will no longer take place. Those living in Fraser will compete alongside other houses in Bishops (Burke and Plessis) against Mount Saint Bernard. This game is set to happen on February 2 at 10pm. Plessis has competed against Mount Saint Bernard in the past, however Burke has historically been known to compete against MacIsaac in the infamous BurMac. This year, MacIssac will instead play against Off-Campus on February 8 at 10pm. The following night, February 9, will be the annual Bath Tub Cup between new res’ rivals Riley and O’Regan. This is the last hockey house cup to take place before reading week. After returning from reading week, students can look forward to more action-packed hockey games with two tournaments. TriMac, a three game tournament between MacPherson, MacDonald and MacNeil will take place from February 28 through to March 2. MacNeil will face MacDonald on February 28 and MacPherson on March 1. MacDonald and MacPherson will face off on March 2. This year will be different for TriMac as boys living in TNT or Chillis will be able to compete for any chosen neighbouring house. From March 12 to March 17 there will be a female tournament for all residences. Houses will be divided into an upper campus pool and lower campus pool. MacIsaac, Off-Campus, Mount Saint Bernard will compete in the Upper Campus pool and Bishops, TNT, Chillis will compete in the Lower Campus Pool. On March 17 there will be a Championship game between the top teams of each pool. Girls living in MacPherson, MacDonald and MacNeil will be able to compete for their respective neighbouring houses.